Beautiful girl running on sunlit wheat field. Slow motion 120 fps. Sun lens flare. Freedom concept. 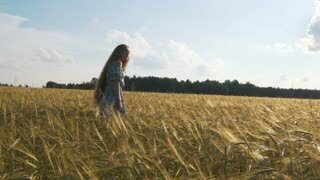 Happy woman having fun outdoors in a wheat field on sunset or sunrise. Slow motion. Harvest.